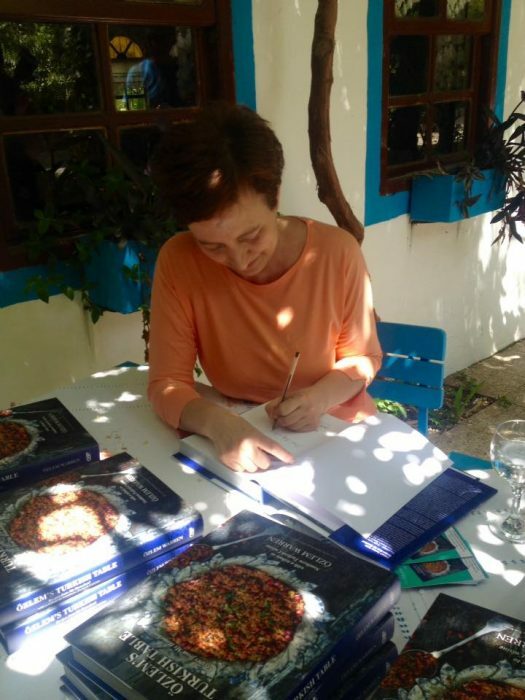 Signed copies of Ozlem’s Turkish Table cookery book, available now (for a limited period)! 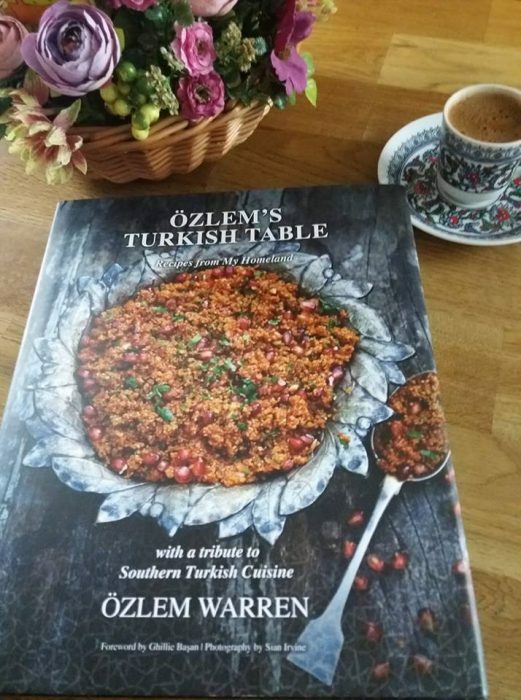 Many thanks to you all, who already got your copies of Ozlem’s Turkish Table and your warm, delightful feedback on the book; so glad to see Ozlem’s Turkish Table cookery book has being enjoyed through your kind shares of your dishes from the book and messages you very kindly showered me. I dreamed about writing this book for over 10 years and it is such happiness to see its being enjoyed. 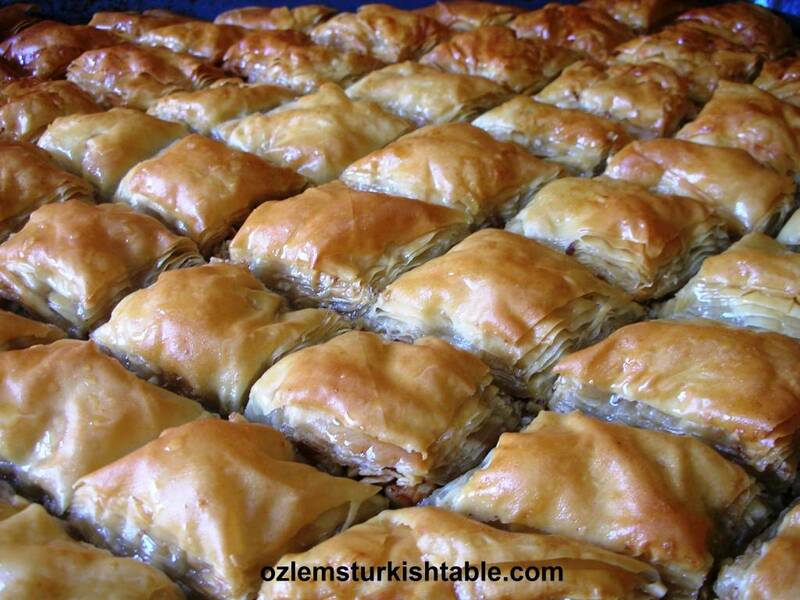 Here’s an recent note from one of the Ozlem’s Turkish Cookery book owner; “Hi Ozlem, many thanks for a great book with fantastic recipes, it’s an invaluable inspiration to me now that I have retired and my new neighbours are amazed when I bring the Turkish food cooked by myself; maybe one day I will let them into the secret”. Delighted to let you know that the signed copies of Ozlem’s Turkish Table is now available as of orders from June 2nd for a limited period! A great opportunity to get a copy for yourself or as a gift. 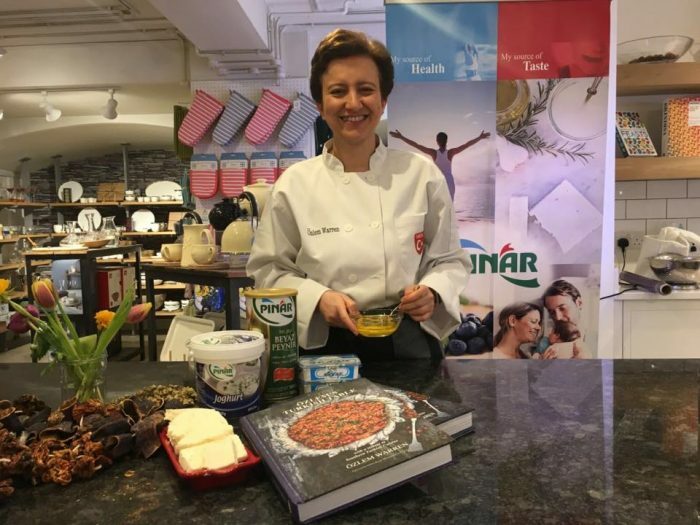 If you’d like a signed copy of Ozlem’s Turkish Table cookery book, please kindly order at this link. It will be delivered promptly worldwide. 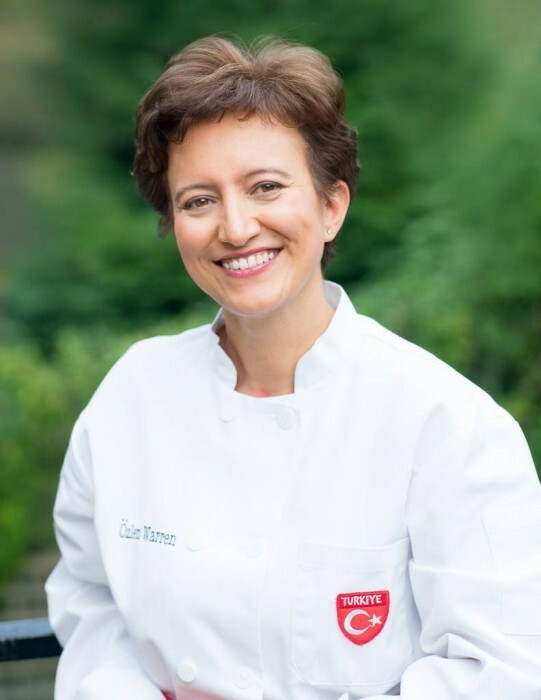 It’s been a very busy but magical few months launching Ozlem’s Turkish Table cookery book , book signings and events in the UK and in Turkey. With this note, my sincere thanks goes to Pinar Foods UK for all their kind support for my book. A special highlight has been sharing my book with my dear parents, Orhan and Gulcin, at our book launch at the lovely Zen Seramics in Istanbul. 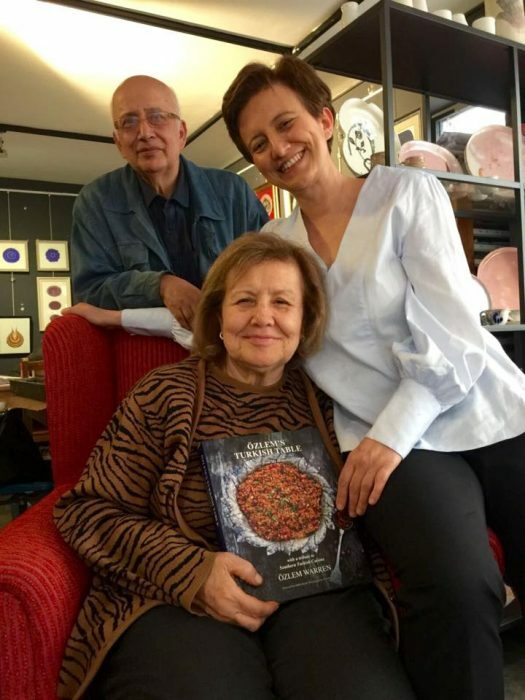 My parents have always been my inspiration with their passion for Turkish cuisine and generosity in sharing, so it was a very special moment to present the book to them. The book has a lot of personal stories and our family heritage and they joyfully grabbed Ozlem’s Turkish Table with both hands with high on emotion (and some happy tears); I think my dad bought over 10 copies to proudly gift to family and friends! Most kind and I can not thank them enough for all their love and support. Ozlem’s Turkish Table book signing at Fethiye! I visited Fethiye at early May as part of Ozlem’s Turkish Table book tour; it was a very special visit meeting Turkish food lovers at the lovely Yakamoz Hotel over a delicious Turkish breakfast and at the delightful Mozaik Bahce, at our Antakya style dinner. 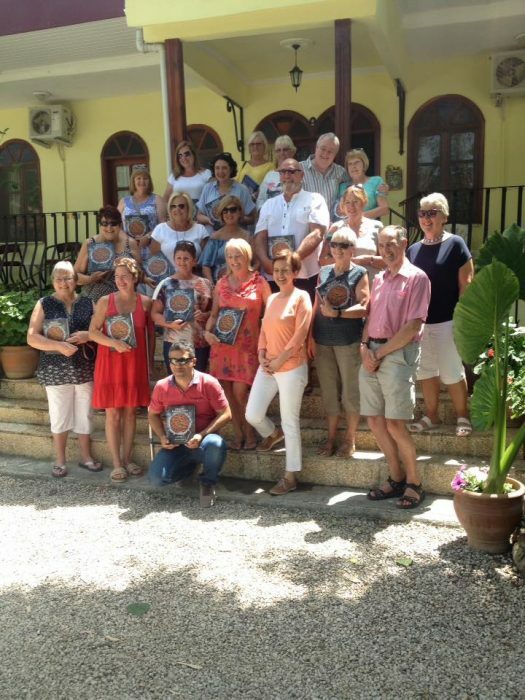 It was a very memorable trip and I can not thank dear Lyn Ward from Fethiye Times enough for arranging our events in Fethiye and all her support. My sincere thanks to everyone who joined our events and their kind interest for my book and to Yakamoz Hotel and Mozaik Bahce for their amazing Turkish hospitality – I can’t wait to be back! 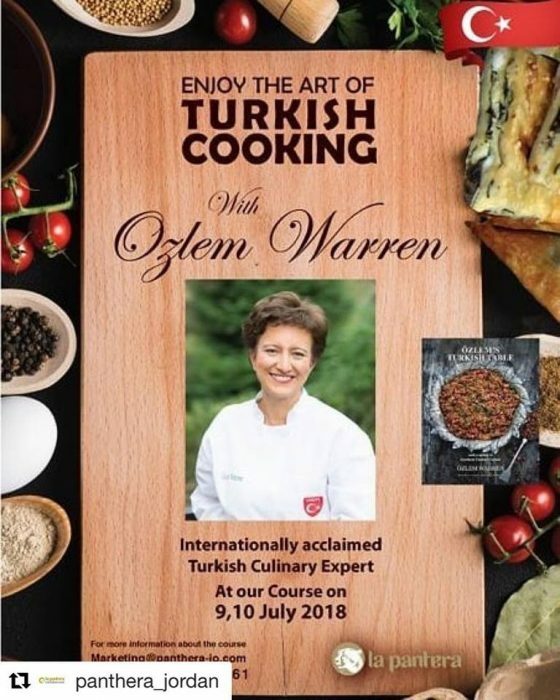 We have done lots of events and book signings in the UK too and it was so lovely to see everyone’s interest for Turkish cuisine and Ozlem’s Turkish Table cookery book. One of these book signings were at the One Tree Book Store in Petersfield; a delightful book store at the heart of the community with the lovely Madeleine’s Kitchen Cafe attached to it. One Tree Book Store arranged a lovely book talk and interview with me and the Madeleine’s Kitchen served Spicy bulgur and Lentil Soup, Ezo Gelin Corbasi, Courgette fritters with feta and dill, Mucver and Revani, Semolina Sponge cake from Ozlem’s Turkish Table cookery book, to a very enthusiastic crowd of 35 folks. It was a magical evening meeting Turkish food lovers and exchanging stories. 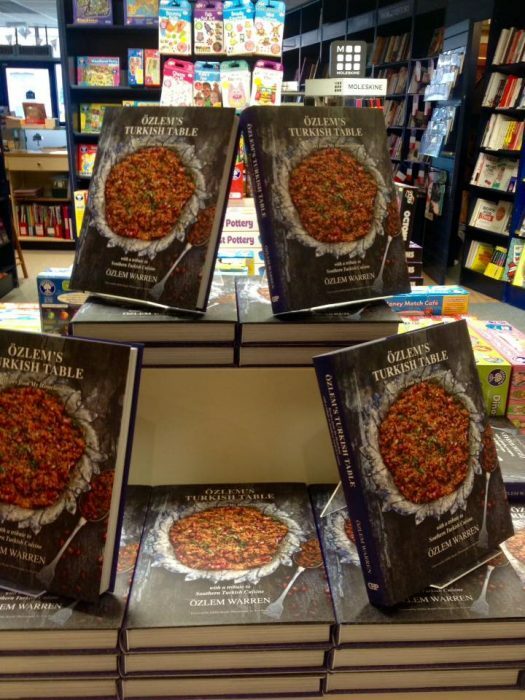 You can get copies of Ozlem’s Turkish Table at One Tree Book Store. 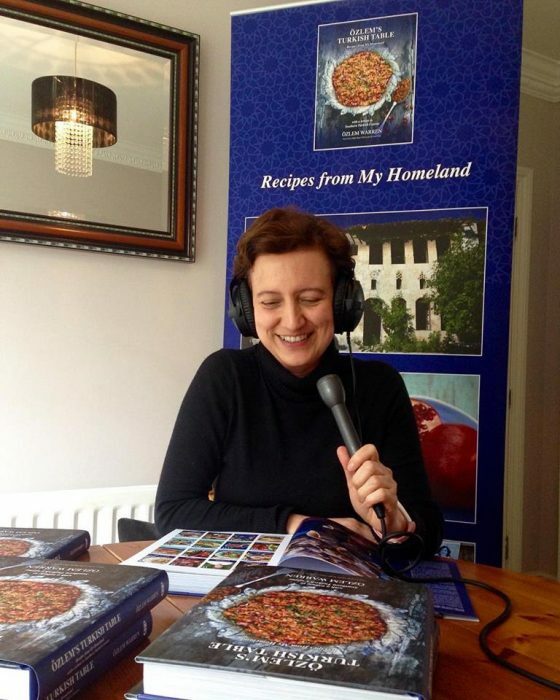 We also had a delightful podcast interview with Christopher Kimball of Milk Street Cookery School and Radio based in Boston – MA, talking about southern Turkish cuisine, stories from my homeland and my cookery book, Ozlem’s Turkish Table. You can listen to this podcast at this link (my interview starts at about 17. minutes onwards), hope you enjoy it. 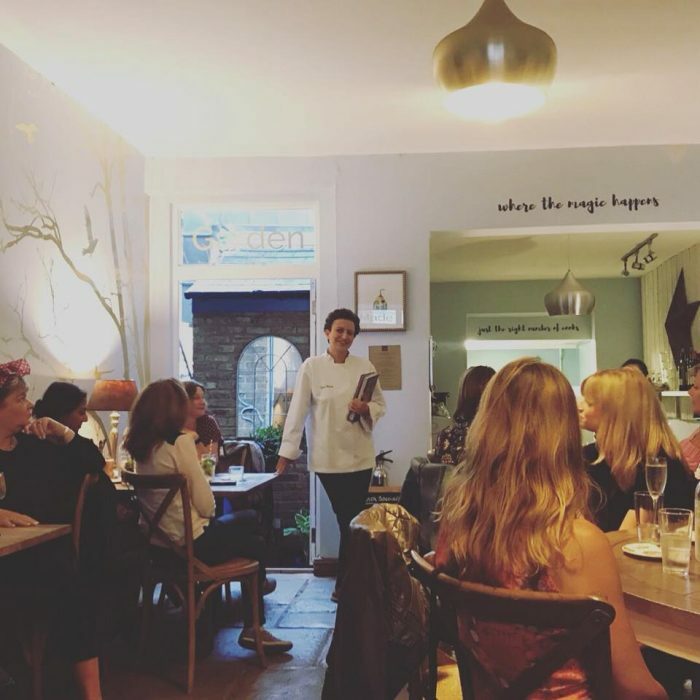 Many more events, classes, supper clubs (as well as a special Turkish cookery master class and book signing in Amman in July) coming up, so stayed tuned. Please join us to recreate a scrumptious meze feast from my homeland, with recipes from my newly released cookery book, Ozlem’s Turkish Table, Recipes from My Homeland. You will be making the much loved ‘Baba Ghanoush’ (Smoked aubergine, pepper and tomatoes with pomegranate molasses), ‘Filo Triangles with Spinach and Feta’, ‘Muhammara’ (Red pepper paste and walnut dip), ‘Circassian Chicken in Garlic, Walnut and Coriander Sauce, ‘Poached Dried Figs in Light Syrup’. 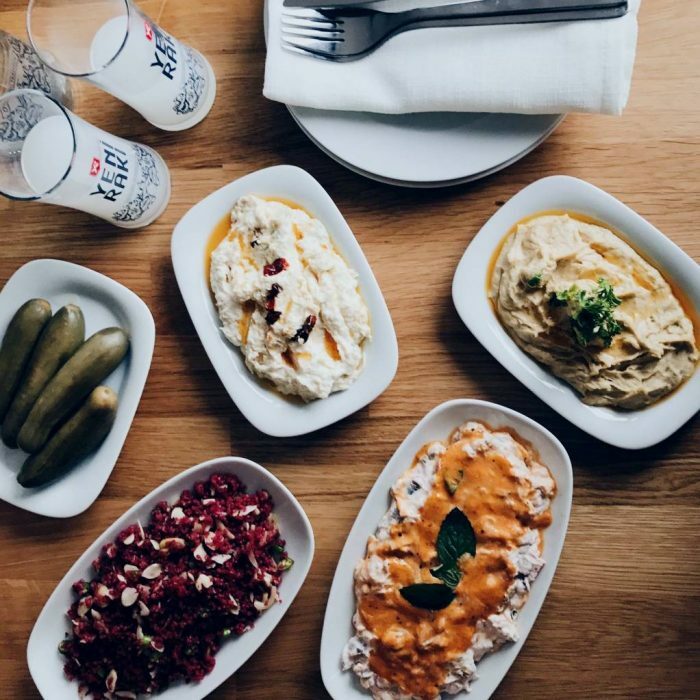 We will be pairing each course with various Yeni Rakı, a Turkish aniseed based drink which is the traditional accompaniment to the meze spread in Turkey. Each participant will also get a Yeni Rakı traditional glass and bottle; a special class not to be missed! Participation is limited, please book your spot at Divertimenti this link, under June 23rd, hope to see you there! Pide bread (pide ekmek), Turkish round flat breads are a personal favorite and special especially during Ramadan, as we traditionally break the fast with pide. 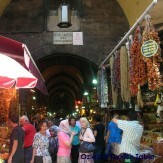 Many of my readers have been making Pide ekmek at home from Ozlem’s Turkish Table cookery book (page 107). 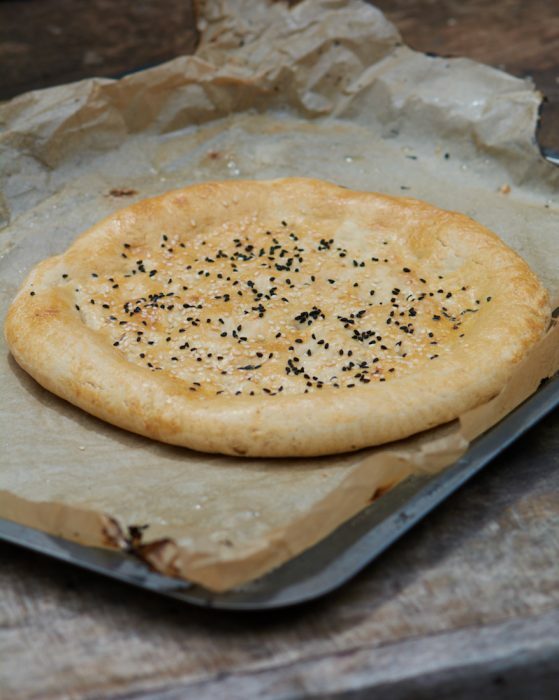 Here’s also the link to my Pide bread recipe if you’d like to make it. 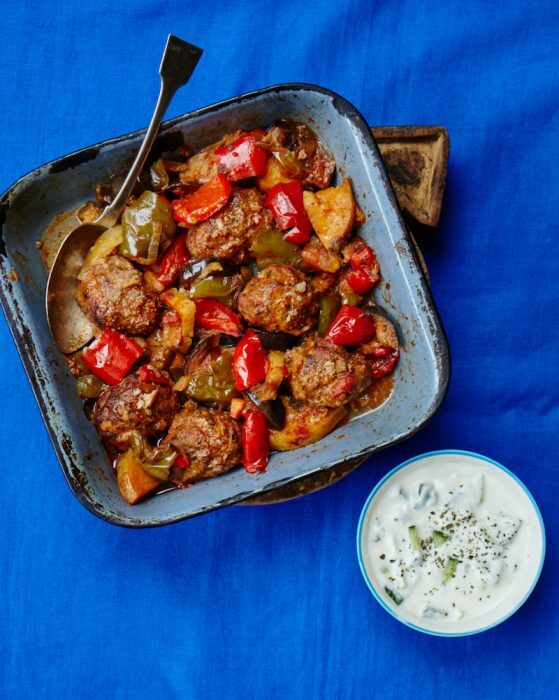 This Turkish meatballs with vegetables casserole, Firinda Sebzeli Kofte, has been another favourite from Ozlem’s Turkish Table cookery book (page 179); I love that you can made this all-in-one pot easy, delicious meal ahead of time and left overs freeze beautifully, a real crowd pleaser – here’s the link to my recipe. 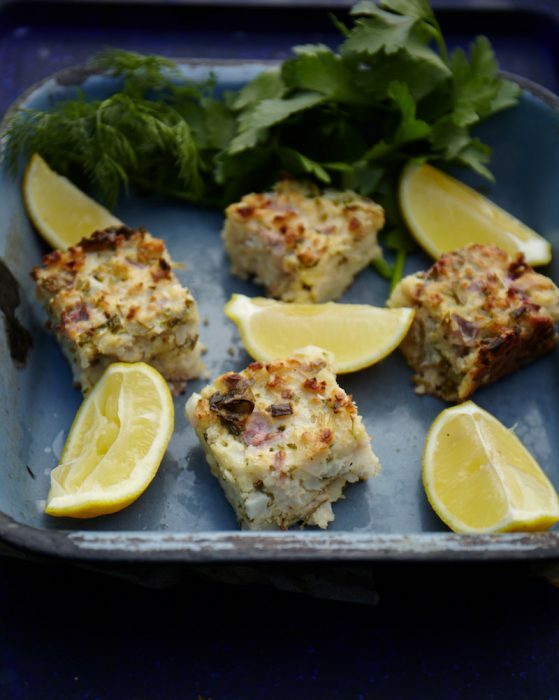 This simple Baked cauliflower with red onions, feta and dill is my family’s favorite from Ozlem’s Turkish Table (page 165) – as a matter of fact, I made twice this week! – Such a lovely and easy way to enjoy and flavour cauliflower, great as a side or as part of your meze spread, here’s the link to my recipe. 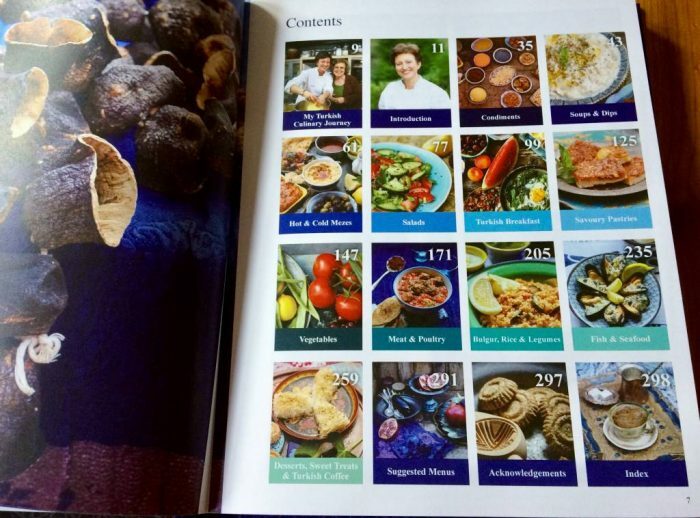 I hope you enjoy the recipes and if you’d like to order a signed copy of Ozlem’s Turkish Table cookery book, you can order at this link, with prompt delivery. 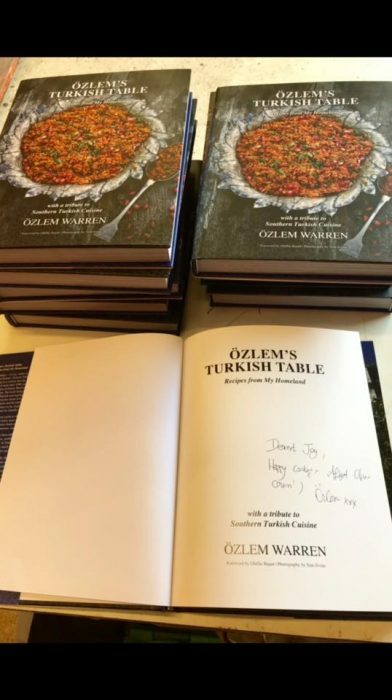 My sincere thanks to you all for your wonderful and kind comments for my cookery book, Ozlem’s Turkish Table; a special project to my heart and it’s been in the making for over 10 years. I am over the moon to hear that you have been enjoying the book. 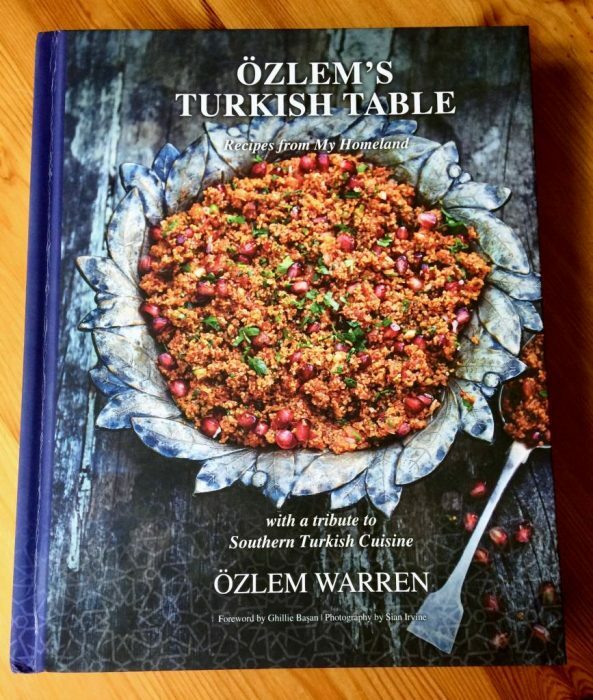 This is a special note as I very much would love to acknowledge many kind, talented individuals who most kindly contributed to Ozlem’s Turkish Table cookery book, in addition to my publisher GB Publishing and the production team. Ghillie Basan wrote a very special Foreword; she has always been a role model with her amazing work, books and as an individual and it meant a lot to me. Ghillie has been so very kind and supportive; I greatly look forward to seeing her in August in Scotland for some very exciting events coming up. 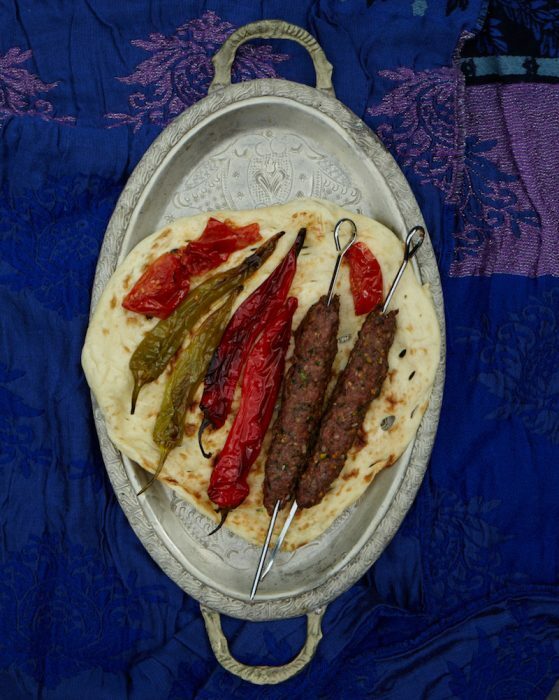 A part from the stunning food photography and still life photos shot by Sian Irvine, many dear friends, passionate photographers most kindly shared their wonderful location photography and other shots at Ozlem’s Turkish Table. I am very grateful to each and everyone for their kindness and sharing of their special shots. With this opportunity, I wanted to acknowledge and give my thanks to them. 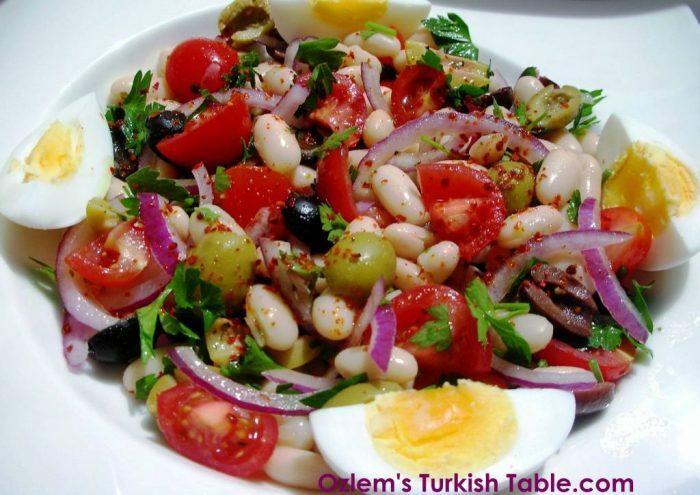 If you have a copy of Ozlem’s Turkish Table cookery book, you can see their wonderful work at these pages specified. I have included some samples of their wonderful shots here too. Please kindly remember that the pictures mentioned here are the copyright of each individual mentioned below. 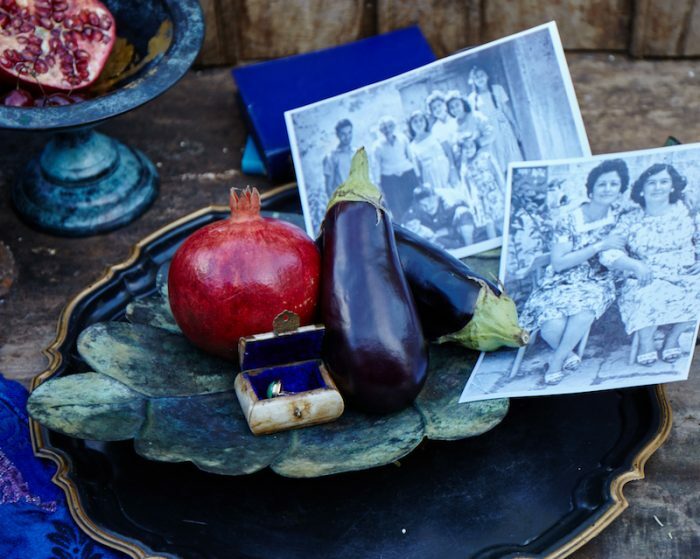 Another dear friend and passionate photographer, Katherine, also most kindly researched and shared her beautiful shots in Ozlem’s Turkish Table cookery book. 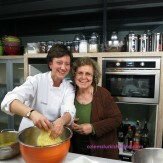 We did a wonderful cookery class with Katherine and friends in Zekeriyakoy, Istanbul a while back and Katherine most kindly took stunning shots during the class and with the permission of everyone in the class (very kindly obtained by Katherine), she let us use them in the book, I am very grateful. 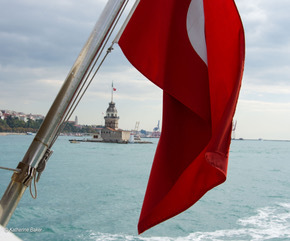 Katherine also have her photos at the opening chapters of Bulgur, Rice and Legumes (at page 206) and of the Fish and Seafood Chapter at page 234 as well as the book’s closing photo of the Bosphorus with Maiden Tower and Turkish flag shot, which I love – . They are all very special contributions and my very sincere thanks to her. 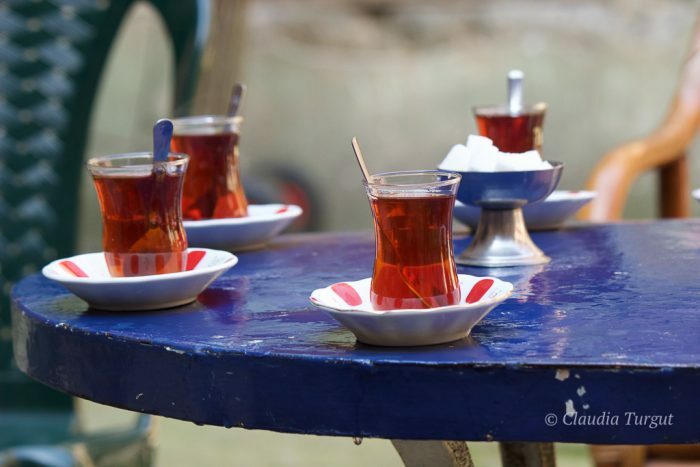 Nancy Laing: Dear Nancy was a part of one of my Culinary and Cultural Tours to Turkey and we had the opportunity to enjoy my home town, Antakya together. She very kindly took the very special shot of my grandmother’s house in Antakya, at page 2-3, as well as the wonderful shots at page 14 -bottom right-, page 15 – bottom left-, 24 – left-, 261 – right column- belong to Nancy. A dear friend and a passionate photogragher, I am deeply grateful to her kindness. My dear cousin Suphi Ural and my lovely sister Oznur Soyen very kindly researched our black and white family photos and provided the special family photos of my grandmother, aunts, my grandfather and family photos at Page 14. 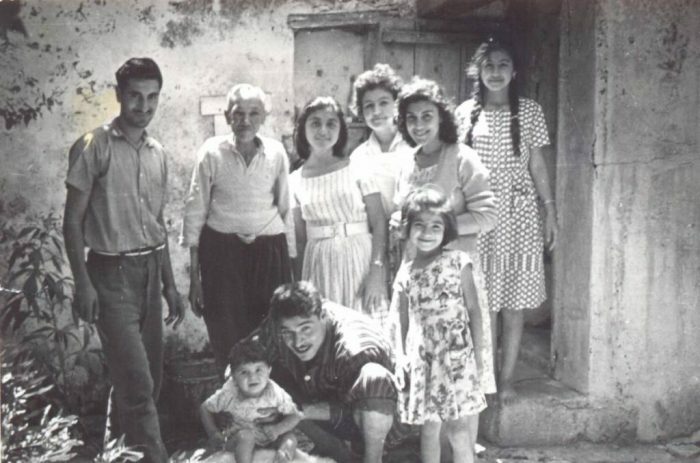 This book is special with the personal stories and family heritage and these family photos have been so dear to my heart, my very sincere thanks to them, cok tesekkurlerimle. Ismail Dasgeldi is a wonderful photographer (and we met on Instagram!). 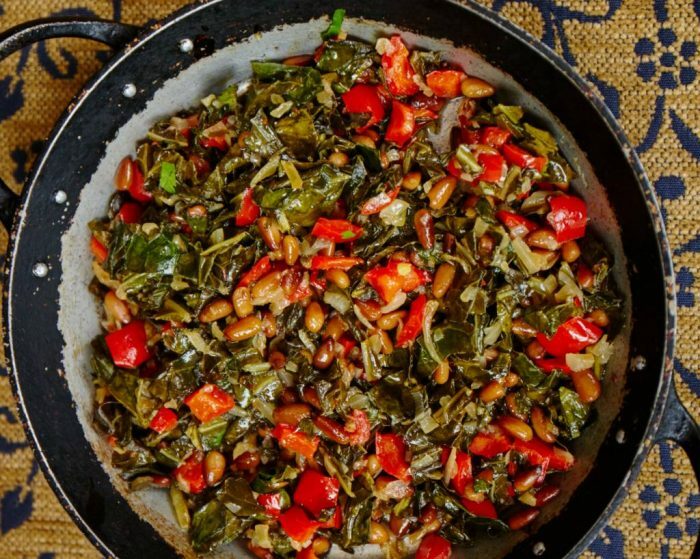 We exchanged correspondence and he most kindly let us use the dried aubergines and peppers shot on Page 23; they are such special ingredients in southern Turkish cuisine and I have been very grateful. Another dear friend and a very talented photographer, Nadia Swindell Photography took a professional photo of mine a while back; it is at page 10 of my book and I used countless of times so far; huge gratitude to dear Nadia. 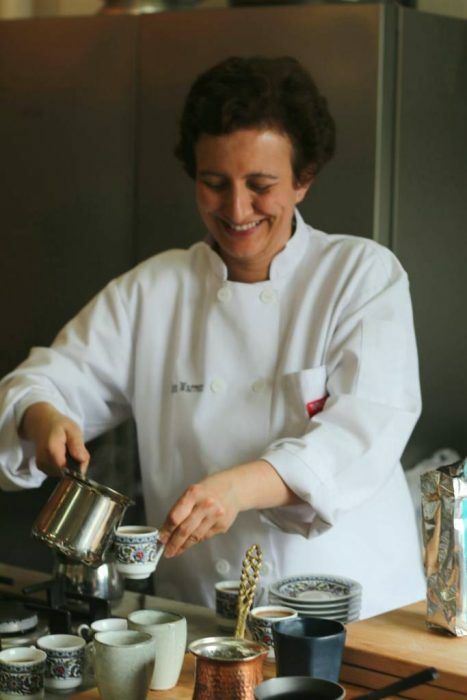 Dear friend and fellow blogger Joy Ludwig-Mcnutt, a very talented chef and passionate photographer, owner of the lovely blog My Traveling Joys, attended one of my cookery classes in Surrey – England and most kindly took a photo of me making Turkish coffee, at my book on page Page 8 – top left –, my very sincere thanks to her. 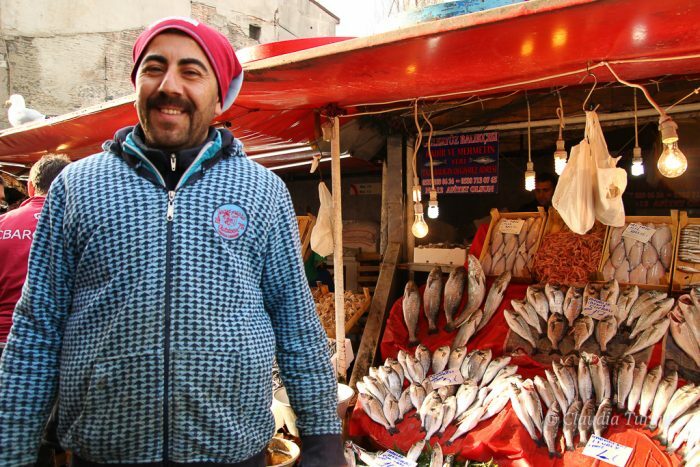 Dear fellow blogger Julia Power from Turkey’s for Life very kindly gave the lovely shot of dried aubergines and peppers and the fishermen on Galata Bridge, Istanbul shot, on pages 26 and 252. Dear Lyn Ward from Fethiye Times gave the lovely boats on the Turquoise coast shot on page 236, my very sincere thanks to them. I will be in Fethiye for Ozlem’s Turkish Table book signing and events on May 3rd, really can’t wait to meet everyone. Dear friends and Turkish coffee and Turkish delight makers Ozerlat UK most kindly gave lovely Turkish coffee and Turkish delights shots on page 293, 296, 303; Turkish coffee is a special drink to my heart and I have been very grateful to their support. Moreover, my very dear friend Gillian Burns, spent months and months with us editing each and every chapter, devoting such a lot of time, love and care across the pond. I simply can not thank her enough. Many dear friends gave their pots, plates, cutlery, props for our photo shoots; many friends, individuals, worked with us as food stylists, prepared the food with us for the photo shoots over 2 weeks period in last July; so many folks gave a lot of support in so many levels and I tried to thank everyone as best I can at the Acknowledgements, and I wished I can even be able to thank more – words are not enough and I sincerely thank each one of you for all your kindness and support on this special journey. 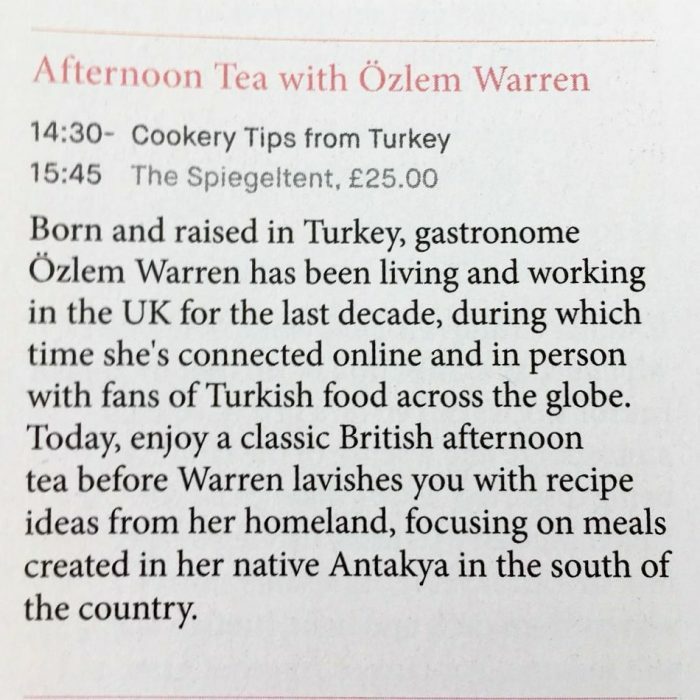 Exciting days ahead as there’s plenty more to come with Ozlem’s Turkish Table cookery book; lots of events, talks, supper clubs and cookery classes in the UK and I will be in Turkey as of 30th April; I am greatly looking forward to them all and hope to see you in one of the events. 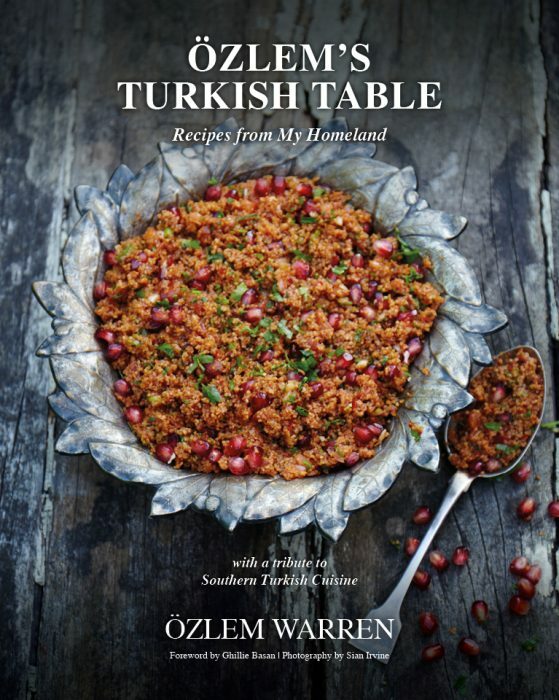 If you can’t make to the events, you can also order a copy of Ozlem’s Turkish Table online at this link, I am told that it has been making a lovely gift. 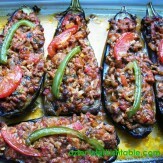 My special thanks also goes to Pinar, for their kind support for my book and Turkish cuisine.